The installation of a fireplace can be a costly and potentially dangerous endeavor, with gas fireplace installation even more challenging still. By the end of this brief article, you will be armed with the information and resources necessary to install a fireplace safely and economically. This article will simplify the fireplace installation process and guide you through every aspect. Regardless of the fuel type, there are common design aspects of all factory-built fireplaces that must be taken into consideration when planning a DIY installation. Factory-built fireplaces are a prefabricated sheet metal system that rely on clearances to combustibles to operate safely. The modular design offers a cost-effective alternative to a traditional site-built masonry fireplace. 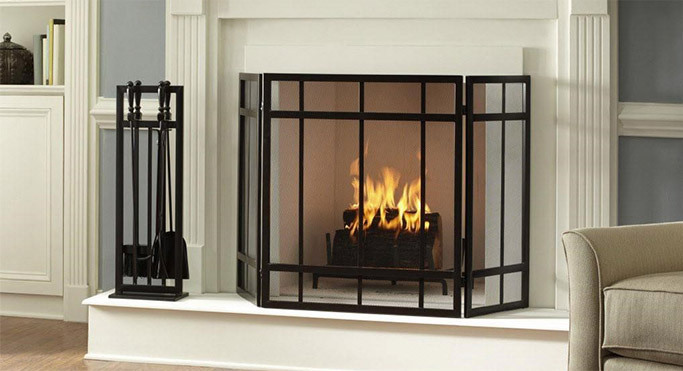 Wood, gas, and electric units will all utilize an inner firebox chamber that is suspended by means of metal supports from an outer fireplace jacket. 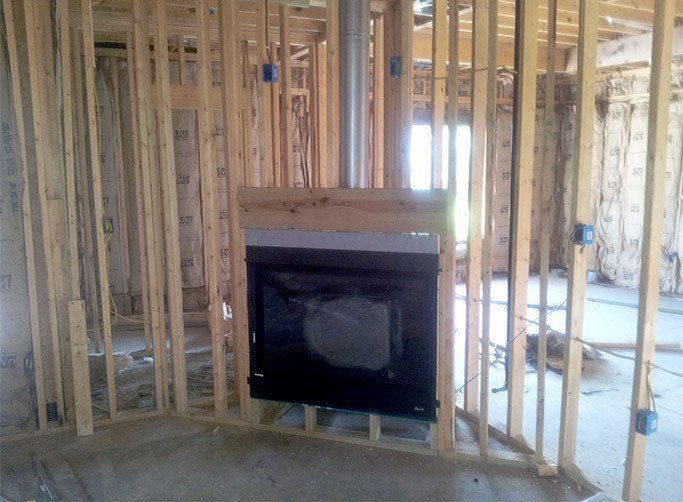 The air space between the inner and outer jackets, and the ability for the unit to dissipate heat, is what allows a prefabricated fireplace to be installed into a combustible enclosure framed from commonly available dimensional lumber. As you may have surmised, the advertised width of a wood or gas fireplace will almost always be in reference to the physical opening of the inner firebox chamber. The need for the air space and outer fireplace jacket means that additional space will be needed to fit the appliance into your intended location. For instance, a wood burning fireplace with an advertised 36 inch wide viewing area may have a framing dimension of 40 inches wide overall. Because heat naturally rises, additional space above the fireplace is also required. Most fireboxes use external metal standoffs to ensure proper spacing is maintained. As with any installation of a home appliance, a detailed instruction manual will be provided that covers many pertinent construction details. This will include the framing dimensions, venting requirements, clearances to combustibles, and other preparations needed prior to installation. It's very important for the homeowner to read and understand these instructions to ensure a safe and successful operation. Before making a fireplace purchase, it is recommended to contact the NFI certified techs at eFireplacestore to discuss your expectations from your fireplace purpose. A gas fireplace will be the most complex type of installation. Before making a fireplace purchase, it's recommended to contact the NFI certified techs at eFireplaceStore.com to discuss your expectations from your fireplace purpose. The sheer number of designs and different venting types can be a bit overwhelming at first, but narrowing the selection down to a unit that will fit your requirements can typically be accomplished in a single phone call. In the long run making that call will greatly help with your gas fireplace installation. It is important to know the overall width, depth, and height of the intended installation area, as well as the overall ceiling and roof height. Most gas fireplaces will list the approved venting components in the instruction manual, and it's crucial that only those components be used. Those venting components are specifically tested and approved by a major listing agency to ensure safe fireplace operation. A tech will be able to assist you in putting together the needed list of components. It must also be determined how a gas line and electrical service, if needed, will be routed to the installation location. Collecting quotes from reputable local businesses for this initial work will leave you in a much better position to determine the overall cost and timeline of the project. Once this preliminary work has been completed the installation itself can commence. Once the projection has been established, the unit can be pushed into the framed opening and nailed or screwed into position. Although framing of the fireplace opening can begin before the appliance itself has shipped to you, we highly recommend having the appliance on site to check against before commencing the installation. Follow the framing instructions supplied with the unit to build a framed opening that meets the sizing requirements specified by the manufacturer. Common 2 x 4 dimensional lumber and a 2 x 8 or 2 x 10 header is usually used. Most manufacturers allow the fireplace to sit directly on a combustible floor. A combustible platform can also be built at this time to raise the unit within the wall opening if you wish. Please refer to Figure 1 for an example of a typical installation with a raised mounting platform. Pay close attention to any side clearances or overhead ceiling clearances outlined by the manufacturer. It's at this time that the consideration for finishing material thickness should also be made. Many installations will be finished out with standard 1/2 inch drywall up to the edges of the unit, but tile veneers and stone veneers are also popular. Whatever the thickness of the material, you must ensure the unit projects forward from the framed opening enough to compensate for the thickness of the finishing material if you are looking for a flush installation. For example, if you're planning on installing a 3/8 thick tile over a 1/2 inch thick cement board, the fireplace will need to project 7/8 of an inch from the facing of your framed opening. This will ensure that the tile will be relatively flush with the face of the unit when finishing is completed. Once the projection has been established, the unit can be pushed into the framed opening and nailed or screwed into position. Some manufacturers provide nailing tabs that will be at different depths on the appliance to help compensate for the setback you need. If the tabs don't provide enough projection, the unit may need to be shimmed as you install it. Check to make sure the unit is plumb and level before nailing it into position. Cedar shims can be used to make adjustments if needed. Other designs use similar caps or lids for the unused flue collar, while a few designs are a dedicated top or rear vent configuration. Installation of the venting components should come next. Almost all gas vent pipes will use a twist lock attachment method. Depending on how you are venting the appliance, you may need to uncover or rotate the venting collar on the appliance for your application. For instance, Superior direct vent gas appliances will have the vertical flue collar covered by a plate and the back collar covered by a cap. If you are venting the appliance vertically, you'll need to remove the plate and discard the insulation and pipe plug within. If venting horizontally, the rear cap would need to be removed in the same fashion. Other designs use similar caps or lids for the unused flue collar, while a few designs are a dedicated top or rear vent configuration. Once the vent collar has been configured properly, the first piece of pipe can be installed. Before attaching to the appliance, a bead of direct vent appliance sealant should be applied to the inner pipe wall. Ensure that the dimples on each pipe align with the channels on the flue collar, and firmly twist the pipe clockwise until it ceases to rotate. Double check the connection by pulling upward on the pipe. If any dimple pulls loose, the connection was not correctly made and should be attempted again. Secure the pipe by installing 3 self-tapping 3/4 sheet metal screws at this connection and every subsequent connection. The screws should only be allowed to penetrate the outer wall of the pipe. Continue your installation with each section of vent pipe, repeating the twist, check, and screw method for the entirety of the run. Check the pipe run to ensure that you are maintaining the minimum required clearances to combustibles at all time. It's recommended to secure the pipe run every 5 feet by wrapping the pipe with perforated HVAC strapping and securing the strapping to adjacent studs. This will limit the amount of lateral motion in the pipe run. Most manufacturers will also provide a sheet metal firestop that should be installed at ceiling level. The firestop can be installed once the ceiling level has been reached. It's common practice to install 2 x 4 lumber immediately adjacent to both sides of the pipe to give the firestop plate something to nail to. Some jurisdictions will also require that you enclose the top of your framed fireplace enclosure with plywood or oriented strand board. If this is the case, the plywood or strand board must be cut to the dimensions of your enclosure and nailed into place atop 2 x 4 scabbing. 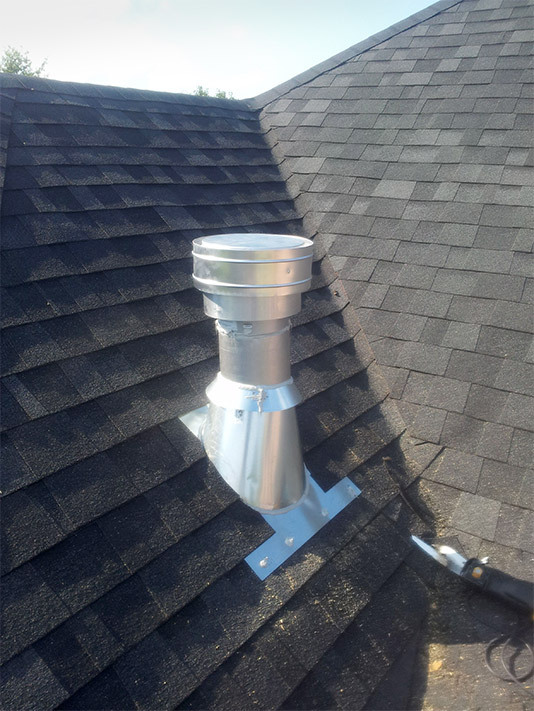 Depending on your preference, the vent pipe can be exposed above the roof or boxed into a decorative chimney chase. if left exposed, a roof flashing will be used to seal the termination. Figure 2 depicts a venting run that has penetrated a wooden firestop and uses metal strapping to support an offset in the pipe run. 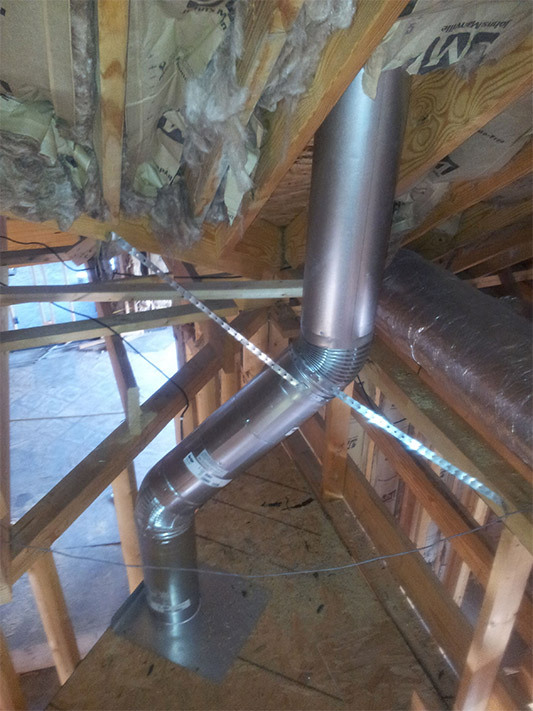 Depending on your preference, the vent pipe can be exposed above the roof or boxed into a decorative chimney chase. If left exposed, a roof flashing will be used to seal the termination. As the pipe installation nears the roof decking, a plumb bob or level can be used to determine the point of penetration. Using a reciprocating or jig saw, cut a hole large enough in the roof to ensure the pipe can pass through and meet all applicable clearances. It should be noted that the steeper the roof is, the longer the hole parallel to the roof slope will be. Installation of the flashing will follow the normal procedure for all roof flashing, with the leading edge of the flashing tucked under the upper most row of shingles, the adjacent shingles lapped over the flashing edges, and the trailing edge of the flashing atop the shingles. The flashing should be nailed into position with 1 1/4 of longer roofing nails and then sealed with a high quality mastic or polyurethane roofing sealant. As you affix and run the last section of pipe through the flashing, the storm collar should be attached around the pipe and also sealed. The cap should be installed last and screwed into position as with the previous pipe sections. Figure 3 depicts a properly finished flashing, storm collar, and cap. Wood burning appliances follow much of the same design and installation requirements as gas appliances, bur there are some differences. Upon completion of the venting installation, the electrical and plumbing that have been previously installed by a local professional can be connected to the appliance. If your appliance required electrical service for the ignition system or circulating fan, there will be a supplied junction box installed inside the unit. This will be outlined in the wiring diagram within the owner's manual. Following the diagram, connect the wire leads of the new circuit to the wire pigtails supplied with the unit. Each connection should be made using a NEMA approved wire nut and electrical tape. Most units will usually provide an anti-strain fitting that will be used to secure the wiring connection. Any loose wire from the circuit should be secured with NEMA approved wire staples. The gas connection to the unit should be made with an approved flex connector and fittings. Most appliances require a 3/8" or larger flex line. Teflon pipe tape or pipe thread sealant should be made at all connections, save for the flex line connections. If there are any doubts to one's abilities for the electrical and plumbing connections, a licensed professional should be consulted. Wood burning appliances follow much of the same design and installation requirements as a gas appliance, but there are some differences. Wood burning fireplaces will always be vertically vented and won't require the use of any sealant at the flue collar connection. They will also not require an electrical or plumbing connection in most cases. The installation of a circulating fan or a gas starting aid would be exceptions to this rule. Because of the potential for extremely high temperature, wood burning chimneys are also much larger in diameter and will sometimes require additional clearances to combustibles. As with gas burning appliances, it is very important to read and fully understand all installation instructions prior to making a purchase. The technicians at eFireplaceStore.com will be happy to provide you with copies of any installation instructions needed for prior review. Strict attention should be paid to the vent pipe clearances required. The vast majority of wood burning fireplaces will use an air cooled chimney system with independent inner and outer walls. Once you have completed the framing and mounting of the appliance as outlined in the earlier part of this article, the assembly of the chimney can begin. Most wood burning chimney systems will use a hem and lance system, as opposed to the twist lock system used by gas appliances. The orientation of the chimney will usually be indicated by a label on the outer wall of each chimney section. Once the orientation has been correctly determined, separate the inner and outer pieces of each section. Beginning with the inner section, firmly insert the end of the section into the inner collar on the appliance. When enough pressure is applied, the section should emit an audible snap, indicating it has locked into place. Pulling upward on the pipe section will verify that it's indeed snapped into position. Repeat the process with the outer wall of the pipe section. Once both sections have been installed, follow the same procedure as with the gas appliance by installing 3 self-tapping 3/4 sheet metal screws at this connection and every subsequent connection. Despite the independent inner and outer wall construction, it is important that only the outer section be punctured. The internal spacers used between the inner and outer walls will ensure that the inner sections remain in position. A few high efficiency wood burning fireplaces will use a twist lock chimney system that has inner and outer walls made together, much the same as direct vent gas appliances. In this case, the assembly procedure essentially mirrors that of a direct vent gas appliance. As with gas appliances, you'll need to utilize a firestop at the top of your enclosure and install the proper flashing necessary for the chimney system you're using. Strict attention should be paid to the required vent pipe clearances. Finishing your fireplace enclosure will be very similar to completing any other drywall, tile, or veneer project. For a drywall application, you will simply need to affix the drywall sheets to the enclosure with coarse thread drywall screws or nails. Drywall cannot touch the metal chassis of the fireplace, and trim kits are available to cover the resulting gap. Stone or tile can be applied to the wall as well. As with any other installation, a concrete or fiber backer board should be secured to the studs first. It's okay for noncombustible tile and stone to cover the metal chassis of a fireplace, as long as the fireplace design has a smooth face with no louvers or grills. Louvers, grills, and other vents cannot be covered. The finishing material also can't cover any part of the fireplace opening, and should not be allowed to impede access to any control panels for a gas fireplace. Each fireplace manufacturer and model is different, so it's essential to understand the finishing section of the manual for the appliance. Each fireplace manufacturer and model is different and it is very important to read and understand the finishing section of the manual for the appliance. While a skilled DIY homeowner should be able to take the information provided in this guide and work through the process with little difficulty, a homeowner who is new to this particular process may be leery of moving forward without additional guidance. It's always recommended to consult with a local professional regarding any uncertainties over structural framing, plumbing, or electrical installation. We at eFireplaceStore.com are always available to answer any questions regarding an appliance you're considering, or any installation questions that may arise. Our sincere wish is to see each of our customers completely satisfied with their fireplace selection and installation process. I would suggest reading our other helpful articles on topics like choosing the proper venting for your fireplace and common mistakes that fireplace contractors make. If you still need additional guidance, please contact one of our certified fireplace specialists and they would be more than happy to help you.